This code is mandatory statewide for Class 1 structures (commercial buildings and residential buildings with three or more dwelling units). The state provides cursory reviews of plans for all new Class 1 buildings and provides field inspections on buildings where no approved local building official exists. This code is mandatory statewide for Class 2 (one- and two-family dwellings). The local building official is responsible for the enforcement of the requirements for all one- and two-family dwellings (Class 2). Indiana’s new residential energy code becomes effective. Rule LSA #11-84 successfully passes through the state’s administrative review process. The rule amends the energy provisions of the 2005 Indiana Residential Code (675 IAC 14-4.3), based for almost two decades on the 1992 Model Energy Code, by adopting provisions of Chapter 11 of the 2009 IRC with amendments to make it equivalent to Chapter 4 of the 2009 IECC. The rule does not propose updates to the non-energy provisions of the state’s residential code. After winning approval from the Office of Management and Budget (OMB), the Indiana Department of Homeland Security (DHS) posts its rule to update the 2005 Indiana Residential Code (currently based on the 1992 Model Energy Code) by adopting the 2009 IRC with amendments to make it equivalent to the 2009 IECC. Developed by the Residential Code Review Committee in 2010, the code has proceeded through the state’s administrative rule review process. The Indiana Fire Prevention and Building Safety Commission holds a hearing on September 16th to accept public comments on the rule, which will become effective 30 days after publication. The 2010 Indiana Energy Conservation Code becomes effective. After months of rulemaking and administrative review procedures, the Indiana Fire Prevention and Building Safety Commission completes work on the first substantial commercial energy code update in nearly two decades. This new code references ASHRAE Standard 90.1-2007 as amended for Class 1 structures (commercial buildings and residential buildings with three or more dwelling units). 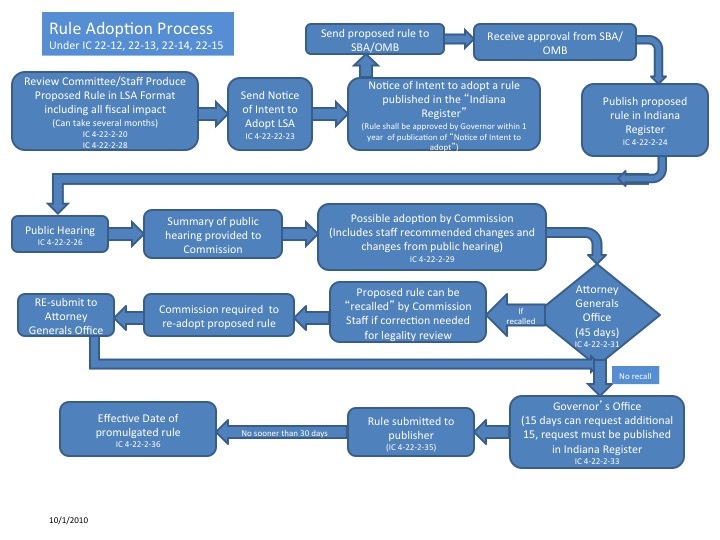 As part of the state’s new rule adoption process, the Rule #09-388 was approved by the Commission in December 2009, repealing 675 IAC 19-3 and adding 675 IAC 19-4 to the Indiana Administrative Code. The rule was approved by the Attorney General and Governor on March 30, 2010 and became effective 30 days after its filing date of April 6, 2010. The Commission continues to work on updating the state’s residential energy code to the 2009 IECC. In February, House legislators introduce bills that would require the state to adopt the latest edition of either the IECC or ASHRAE 90.1 by July 1, 2010, and any subsequent editions within two years of their publication. A companion Senate bill is also introduced, though it only called for adoption of the latest IECC by July 1, 2010, and adoption of subsequent editions 18 months after their publication. On May 11th, Governor Mitch Daniels vetoes HB 1348, which would have adopted the 2009 IECC or ASHRAE Standard 90.1-2007 for commercial buildings. The governor’s veto message calls the bill “good policy,” but also “superfluous.” He cites a need to prevent redundant “clutter” within Indiana law given his direction to the state Fire Prevention and Building Safety Commission to begin the process to update the state’s energy codes months beforehand. Though the bill passes both chambers of the legislature by near-unanimous majorities (47-2 in the Senate, 96-0 in the House), a legislative override of the veto does not take place. Governor Daniels signs Executive Order 08-14, requiring all new state buildings to earn LEED Silver certification, the EPA Energy Star rating, two Globes under the Green Globes rating system, or the equivalent under an ANSI accredited rating system. The order also requires that all renovations of existing state buildings must follow LEED, Green Globes, or other guidelines.